9 Jan. 2012: someone pointed out that I had a typo in the preview image, and when I went to fix it, low and behold the spacing in the font (when you hit the space bar) wasn't what I had intended... must have been the last save that messed it up, oops! 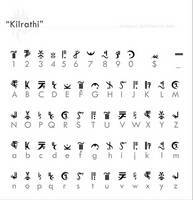 Gerudo SHOULD have a fair amount of spacing if you look at the exceprt in Hyrule Historia, so I reuploaded the font with the slight update. It doesn't effect the font usage, but it looks a bit better now. Sorry for the trouble! 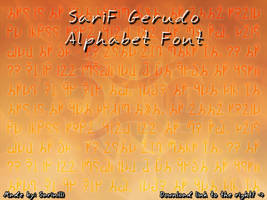 This is a font for the official Gerudo Alphabet, or "Geldo" Typography according to Hyrule Historia. 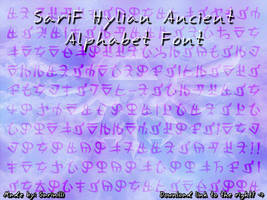 This alphabet dates back to the original release of Ocarina of Time, but was used so obscurely in the game that it was never properly discovered by fans as being a proper alphabet. Thanks to recent releases in Japan we finally have an official Gerudo alphabet! * Note: According to the Japanese texts, this is actually called GELDO'S Typography. While Geldo is apparently the proper official name of the Gerudo, I have stuck with Gerudo due to this being the long thought official translation. This font contains letters A through Z, a hyphen which substitutes ad a period, and a comma which substitutes as an apostrophe, as well as the letters 1 and 5. 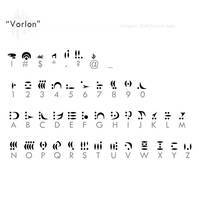 Please remember like all of my fonts, this IS free for personal use only, and I prefer requests for permission before allowing any outside hosting. Otherwise... 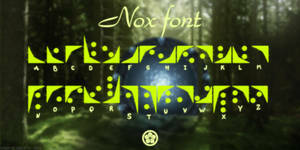 I hope everyone enjoys this font! 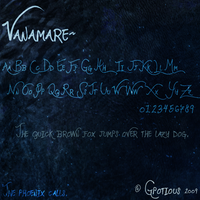 Please remember like all of my fonts, this IS free for personal use only*, and I prefer requests for permission before allowing any outside hosting. My "made for an official alphabet" Zelda fonts technically still belong to Nintendo so I HIGHLY recommend against using them for profit! I cannot be held responsible if you use this font inappropriately. For your own sake and safety, you have been warned. 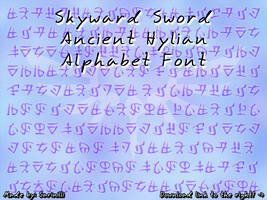 I used both this and the Ancient Hylian font! I'll just call the Gerudo language Geldo from now on. So, how does the font thing work? I'm new to using alternate fonts on... well... anything aside from sites that have it hardwired. 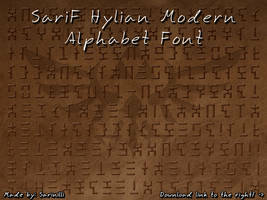 Oh wow, this will be your first ever installed font? If it's mac..err..... 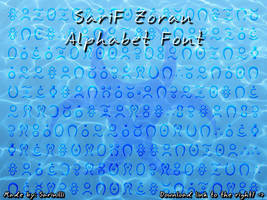 google..I always forget how to install fonts on mac. 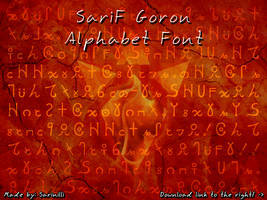 Should be in font drop lists as "Gerudo's Typography"... how did you install it? The way I was told to. hmm.... hit the windows key and e; that'll bring up the file explorer... navigate to C: / windows / fonts and see if it showed up in there... if so, try restarting and see if it'll work. If not, or if it's not in there, you can copy and paste the font directly into the fonts folder. Hello just wondering but where can i download it. their is no link that i could find. DeviantArt has such an old download button that's not easy to see for new users. Look on the FAR right side, just under the little adds box; there's a green arrow pointing down on it. Why won't this properly download to my mac? Won't download..? Or won't install? Can you walk me through what you've tried to do so far? Hmmm.... it says not installed though? Have you tried actually installing it? I think I remember someone once saying they had a weird issue with the preview not showing properly but the font working fine once it was installed fully. Might be that the same is happening with you? Let me know if it works, if not, I'll see if I can debug. There is a slim chance it might have something to do with my font creator program being severely outdated...it should work fine, regardless, but I have had some strange issues reported that I can't explain or figure out, so there is an off chance it may have to do with some odd versioning issue. I sure hope that's not it..
After having the same problem for a long while, and ultimately fixing it, here is my best (but still very limited) understanding of what's going wrong. Macs have a separate way of naming and locating fonts. A Mac-specific name is missing from Gerudo's Typography, so it is completely possible to successfully install Gerudo's Typography and promptly have the Mac lose track of it, which means it can't make use of it and (incorrectly) reports that it is still not installed. If you have something able to edit fonts, though, you can go in and supply the missing name to the 'Mac name' field of font information, save the font, reinstall it, and all seems to work fine. I've done this in Typelight (pick 'Names...' from the 'Fonts' menu bar, click advanced, add in the mac name). I don't know what program you use to edit fonts, or if this is at all helpful to you, but here's hoping! Oh lord... this may be why I really NEED to look into getting the newer release of the font program I use. I have version 3; version 9.something is now available... I just checked the font in my own program and the only mac naming options I have available to me are in fact set. So the only answer I have is that my program is just far too old and is missing vital information for newer mac systems specifically. Exactly what I was afraid of. Ah! I thought I'd replied to this ages ago -- sorry! A short term fix might be to get a limited-feature freebie font editor like Typelight and then, after editing fonts in the fancier, not-free editor do the last fixes to file info in the free editor? Or, heck, I could do the fine info stuff and just send you the files? Or I could post the mac versions (with links and clear statement that they were yours, obviously) or... I guess all these options -do- sound a bit Byzantine, but they are options. Thanks so much for the suggestion and offer! i then proceeded to install it thinking that it might just be a fluke, but when i type using the font in word, it just fills the document with spaces essentially. Thank you so much for this. It adds the perfect flair for my fan-fiction cover. Ok...if you insisdt, you LOZ nerd. But I mean that in a good way, lol. Zelda tattoos are awesome. 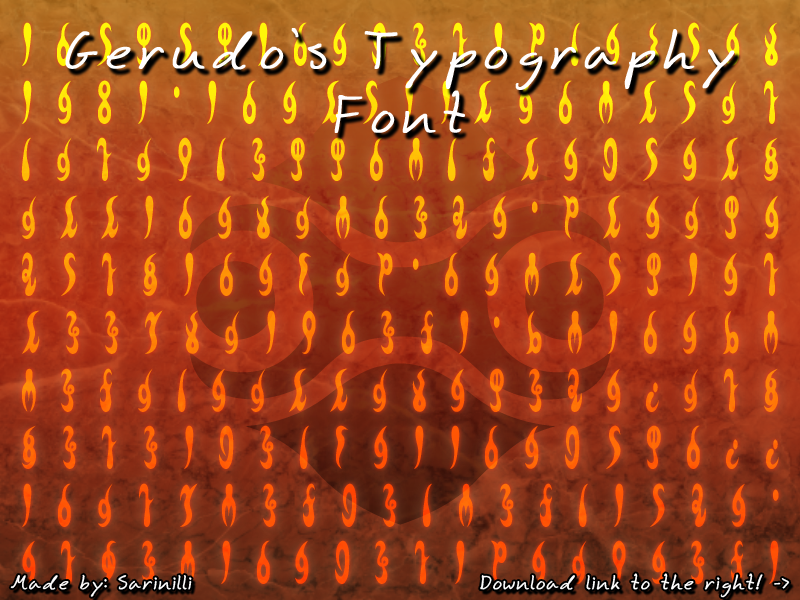 I just found these fonts today (thank you Cracked), and everyone seems to think that the numeric digits in the official Gerudo font stand for 1 2 3 4 5, and we'd need a buttload of consecutive 5s for high numbers. And I'm thinking... That's Base 5. Why can't those digits be 1 2 3 4 0? Or 0 1 2 3 4, rather? Where 5base 10=10base 5, 610=115, 1010=205, 2510=1005, 5510=2105, etc. Wikipedia calls it Quinary, apparently. Umm... Something tells me you haven't got yourself a copy of Hyrule Historia. There are only numbers for 1 and 5. Nothing for 2, 3 or 4, and it says clearly that the only two numbers mean 1 and 5. So..doesn't work, sorry. Well crud. And if they're just 1 and 5, that rules out binary...no it doesn't. 1 5 51 55 511 515 551 555 5111 Binary works. I think. lol I still think that relating it to roman numerals makes more sense. Since I is 1 and V is 5.. I think if it was binary it would have been a 0 and a 1, not specifically 1 and 5. That's why I didn't suggest a connection to binary in the first place. Still doesn't make much sense. Maybe it's a good thing we don't see too much of the Gerudo culture. Translating the math is confusing enough. What Sarinilli is saying about it being roman numerals was the same conclusion i came upon first glance. Binary might make more sense to YOU than roman numerals, but if you ask me the idea that you would write out THAT much stuff for one number in your binary theory is ridiculous. Regardless, I REALLY wish they would develop the Gerudo culture a little more in these games. Why are the Gerudo forced to live in the desert, the land not blessed by the Goddesses and the Triforce? Why is it that the Gerudo are the only race that show any prowess in "magic" except for the goddesses, deities, and the Twili? Of course there is the fact that Zelda can do a little magic and so can Link but only with the help of the goddesses and magical items. Why is it that they don't show up AT ALL in Twilight Princess? Why is it that the twilight mirror is located in THE DESERT? Why is the desert in OoT is described as the place of exile from the Goddesses blessings for the Gerudo and in TP the Twili are described as being exiled to the Twilight Realm, from the land of the Goddesses blessings? ARE THE TWILI REALLY JUST THE DEFORMED DESCENDENTS OF THE GERUDO??? Binary for the Gerudo numbering system made sense to me two years ago. Now, rereading that conversation, I have no idea how I came to that conclusion. I have no idea how to use this .__. How so? Have you never installed fonts before or do you mean how the alphabet works? How does one make one of these? 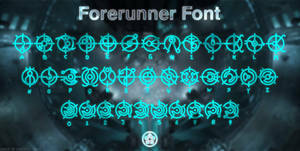 I have an old version of "font creator program". Really need to get the newest version, but 80 dollars is "wish list" for me right now. omg this is so perfect for my valentines!!! he loves zelda so much!!! thanks for the amazing font! Oh my gosh, I'm really sorry I almost forgot to credit you! Anyways, thanks a ton for making this! It's a very beautiful font and I love it!